Get at-a-glance access to your account balances, market data, and much more with a dashboard customized just for you! 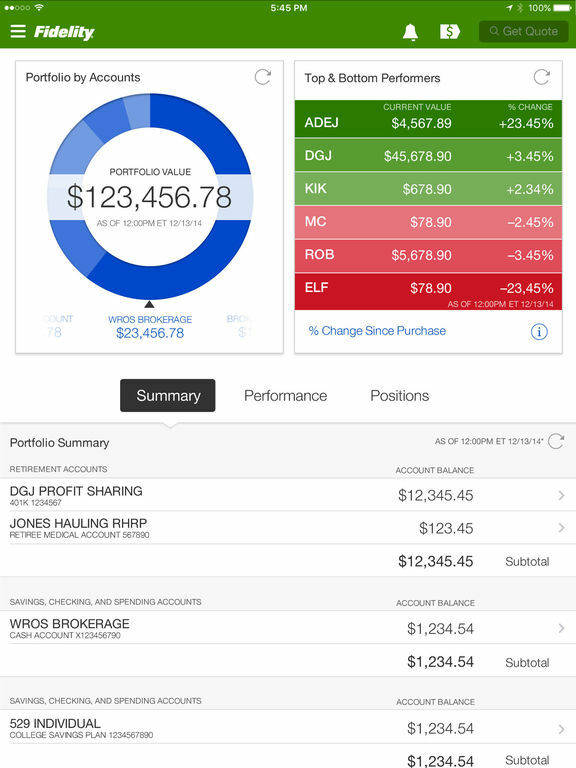 The Fidelity Investments app for iPad offers all you need to keep up with your finances including real-time, immersive data visualizations, and personalized Research & Guidance from Fidelity Viewpoints®. • Multi-Leg options trading for simultaneously buying and selling multiple option contracts. • Standard and custom option strategies. 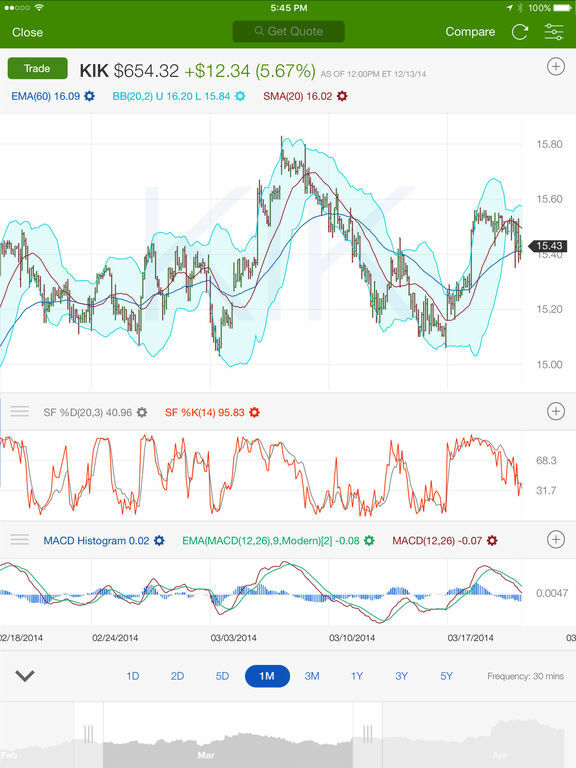 • Specific Share Trading for Stocks and ETFs, so you can control the gains and losses reported for your trades. • Tax lots, now available for your positions. Move money between accounts, deposit checks with the snap of a photo, and pay bills with Fidelity BillPay® anytime, anywhere. 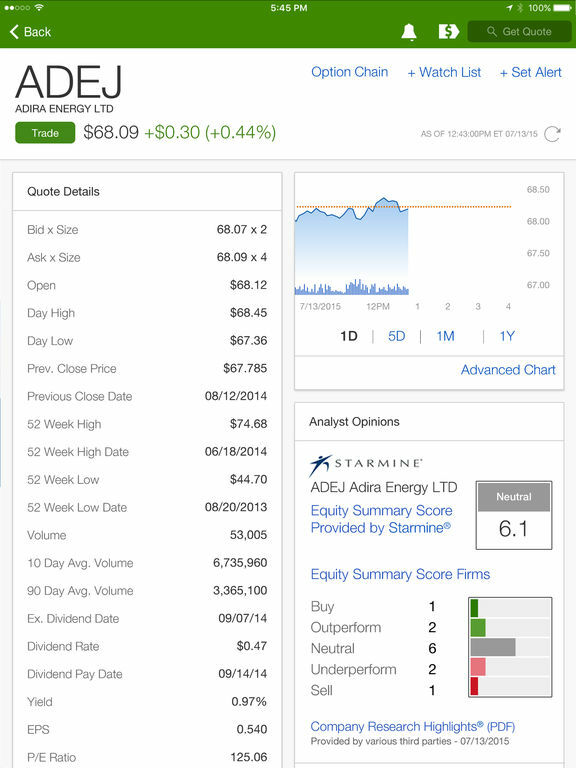 Trade stocks, options, mutual funds, and ETFs anywhere, anytime. Our mobile Apps are built with advanced data encryption, so you can safely trade from wherever you are. Receive timely, customizable alerts via push notifications, or visit the message center to view and manage streaming alerts. Check balances and keep track of the positions in your brokerage or workplace savings accounts. 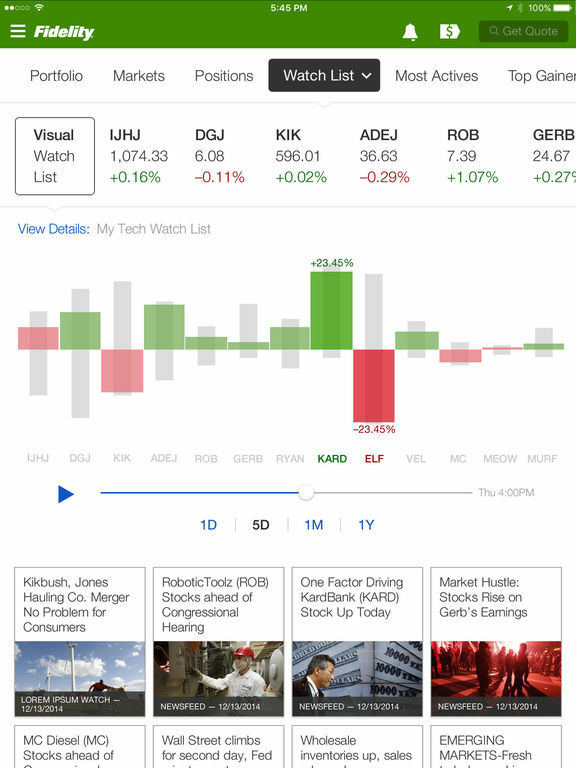 * Use Watch List Visualization to see the historical performance of your watch lists using a time-based control. You can also compare selected securities with industry- standard data points such as P/E ratio, 90-day average volume, market cap, and earnings per share (when applicable). To learn more about Fidelity’s App, check out our video at fidelity.com/iPad. *Workplace savings account functionality is limited to viewing account information only. Fidelity, Fidelity Investments, the Pyramid design logo and Fidelity Mobile and service marks of FMR LLC. Apple, Bloomberg, Zacks, Recongia, Econoday, FirstRain, Trefis and Fidelity Investments are independent entities and are not legally affiliated. We care about what you think. With your help, we’re able to constantly improve our Fidelity Mobile® apps and address the concerns you bring to our attention. All the feedback you provide is valuable to us—we read and consider every comment we receive.